As a technical professional, you have mastered complex information and ideas. Communicating your expertise to a general audience, though, can be a challenge. Our program, tailor-made for professionals working in engineering, technology, science and other technical fields will help you bridge that gap. Develop versatile writing skills that will help you craft compelling, clear technical documents. Communicate with precision and confidence—and become more effective in your job. Don’t let the writing process be a barrier. Hone your technical writing skills and craft reports, briefs, status updates and emails efficiently, giving you more time to focus on the work that drives your organization. The flexible format lets you design a learning schedule that works for your busy life. Frequent interactions with other students and your instructor mean you’ll never feel like you’re learning on your own. 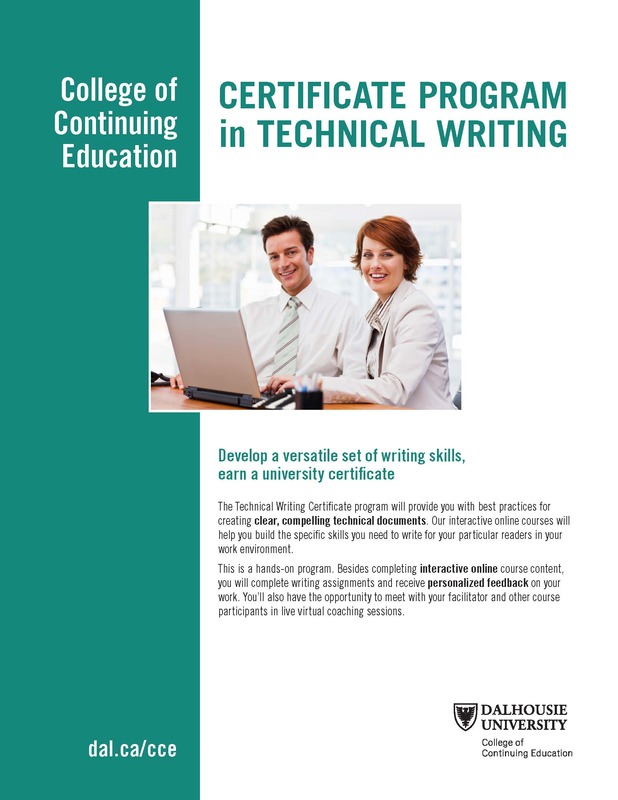 Earn your Dalhousie certificate with just four courses: Technical Writing Essentials and three electives, taken in any order. Or take individual courses on a stand-alone basis. If you’re looking for a grammar brush-up or specific strategies to write concise and informative technical reports and proposals, we have a course for you. Gain the fundamental technical skillset you need to communicate complex ideas clearly and simply. Required course for certificate. Learn tips and techniques for producing concise, easy-to-read documents that span the project lifecycle. Move readers to action. Develop practical strategies for analyzing your audience and writing powerful, clear content. Learn how to write technical content for reports that are simple to navigate, easy to understand and impactful. Gain control over grammar and punctuation, and be confident that you are communicating clearly and correctly. Explore techniques for crafting emails that rise above inbox clutter, clearly express key messages and get results.